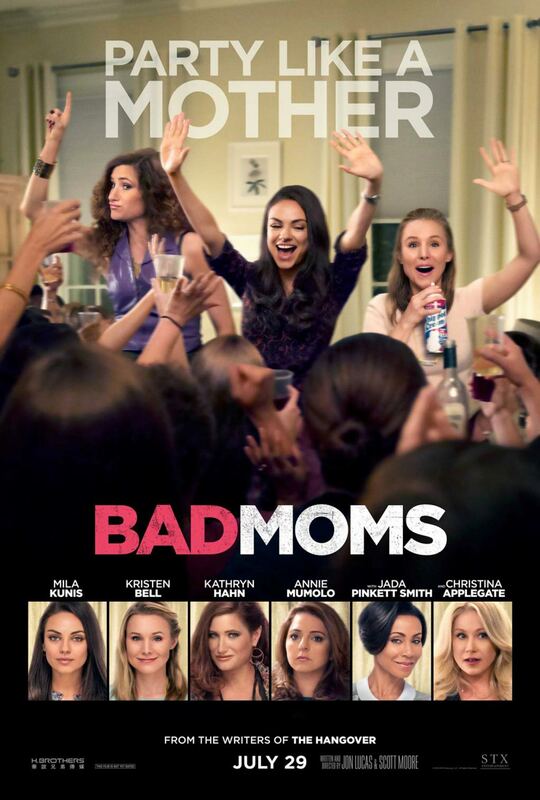 Bad Moms is the latest comedy in theaters and I probably don’t need to tell you who the stars are in it as you can read the poster above. The lead, played by Kunis, is a mother of two who struggles to keep up with all the demands of her professional and domestic responsibilities. The Kunis character decides to make some changes to her life after discovering that her husband is cheating on her. She stops being a “perfect mom” who does her children’s homework and brings food to the bake sale and becomes a “bad mom” who takes time to relax with her friends and starts giving her children the onerous responsibility of cooking their own breakfast. The central conflict in the movie is between Kunis’s character and Applegate’s. Applegate plays the head of the PTA at the local school. When Kunis quits the PTA Applegate vows revenge and starts a petty “war,” abusing her position to hurt Kunis and her family. Kunis decides to run for PTA president in response, to take away Applegate’s power. The movie isn’t so much about being a “Bad Mom” as I think I facetiously pointed out, but about being a bad PTA member (most of whom are mothers in the movie). Plot ensues along with lots of good jokes and physical humor coming from everyone on the cast. The trailer does not have the only jokes in the movie like some other comedies I’ve seen, plenty of content that will make you laugh. Bad Moms didn’t leave me in tears or have me questioning everything I thought I knew about parenting, but it did make me laugh a lot. What more can you ask from a comedy? If you liked Kunis’s other comedies or you liked Pitch Perfect then you will probably really like this movie. Additionally there is a part at the start of the credits where all the main cast members are interviewed along with their mothers. It was a adorable, sweet addition to the movie and a nice look into the childhoods of a few celebrities that I might not’ve cared about otherwise. If you want to laugh at some funny women, go see Bad Moms. It’s pretty momilicious (Is that a stretch? We’ll go with it.). The other day I saw Sisters, the comedy starring Tina Fey and Amy Poehler. I’ve heard that Fey and Poehler are good friends and that definitely helped with their chemistry in Sisters. Fey and Poehler produced the movie and given how the movie played out it seemed very much to be a movie they had chosen because it needed a pair of leading ladies. The two sisters are opposites. Fey plays Kate, a mother of a college-aged daughter and a hair stylist who is constantly getting fired for her attitude. Poehler plays Maura, a goody two-shoes character who is financially successful but still has trouble talking to men. Both women are in their forties. The parents of the titular Sisters move out of their old home into a retirement community. They call their daughters and ask them to come clean out their rooms before the sale of the home closes. Kate and Maura are upset that the house representing their childhood is being sold. As a way of saying goodbye to that part of their lives and moving on into the future they decide to throw one last house party. They invite all their friends from high school who are still in the area. From there the movie is fairly predictable. Crazy hijinks ensue. Drugs are involved. The cops are called. The party gets more and more out of control. By the end the house is absolutely wrecked. While there were some good parts I did not like the movie as a whole. Comedies don’t always make me laugh when I watch them alone, but in a room full of people I expect to laugh a lot. I did not laugh much during Sisters and neither did the other people in the theater. The jokes just weren’t good enough. Sisters also offered a weak subplot of Kate and Maura working out the personality problems they’d taken from childhood to adulthood. This plotline didn’t really move forward until the final few minutes of the movie. It served as a vehicle for the jokes, which is fine in most comedies, but not in ones that aren’t funny. It’s possible that I just missed the jokes because they were directed at people in their forties like the characters in the movie; however, there were a few middle-aged people in the theater and they weren’t laughing either. Maybe the movie would be funnier to people who are fans of Fey and Poehler, but that’s not me. I dislike their past work. Ultimately, I can’t really recommend seeing Sisters. A comedy that isn’t hilarious just isn’t worth watching.